Lionel Messi, scooping up the prestigious individual award for the third time in his career. successfully defend his Ballon d’Or title after Johan Cruyff, Kevin Keegan, Karl-Heinz Rummenigge, Michel Platini, Marco van Basten and Messi. “I want to thank my mother, my family. I would like to thank all those who voted for me, my coach, my fellow players, the president of the club,” Ronaldo commented while collecting the award. “It has been an unforgettable year. To win this trophy, a trophy of this kind, is something unique, and like I say, I want to continue working as I have so far, trying to go on and win more titles both individually and as a team, for my mother, for my father who is up there looking at me, my son, and to become better. “I would like to say to the Portuguese: I never thought I would win this trophy on three separate occasions. Of course it is something that is always with me – I want to become one of the greatest players of all time and I hope to get there. 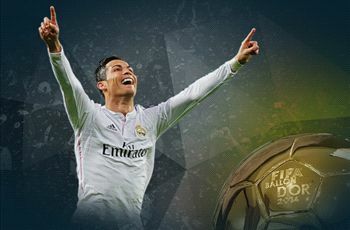 I want to thank you all,” concluded the Madrid star before leaving the stage with a loud roar. goalkeeper to win the award since Lev Yashin in 1963 after guiding Germany to World Cup glory and winning the Bundesliga title and DFB-Pokal with Bayern. He earned 15.72% of the vote. Please we need the video..
neuer was suppose to b in second position.nt messi…if nt for fifa ojoro..messi shldn’t b on top 3 cos som big players performed far beta dan him last season. Sure u baba mi I love u die……. Kudoz 2 my guy dat does nt rekogniz me. But I do praiz him,next year z urz,jst keep doin it!! !we lov u all! u ar de only one to won de ballon d or CR7. 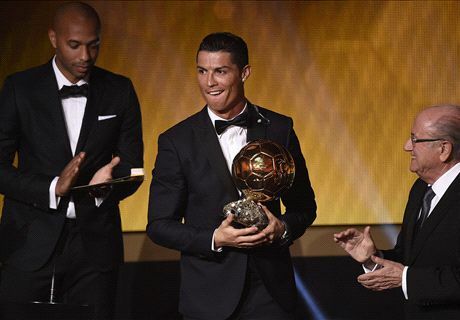 u ar di only one to deserve di ballon d OR CR7:congratulation i celebrate wit u.